A gift to the Buchanan Alumni House from Cherryfield residents Hugh and Jenny Lassen as part of the Littlefield Gallery Sculptor-in-Residence Program, Rhino was created from granite excavated from the Lassens’ blueberry field. The massive dark piece, completed in 2015, rests on a granite base. In discussing his work, Lassen writes, “my own sculptural aims revolve around mass, bulk, weight” — goals powerfully actualized in Rhino. Lassen’s sculpture complements the nearby Traditions Garden; both guide the visitor into the Alumni House. 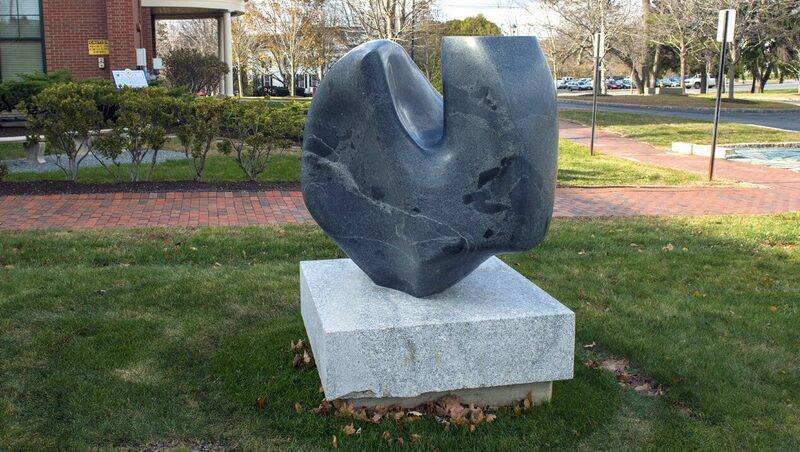 A smaller piece by Lassen can be found in the Alumni House’s South Garden.